In one of the final battles of the ongoing Clone War Obi wan Kenobi and Anakin Skywalker engage Dooku in attempt to rescue Lord Palpatine. Prodded by Palpatine Anakin beheads an unarmed Dooku to begin his decent to the darkside. Obi-Wan Kenobi is then sent to take down the leader of the droid army, General Grevious, and end the Clone Wars. 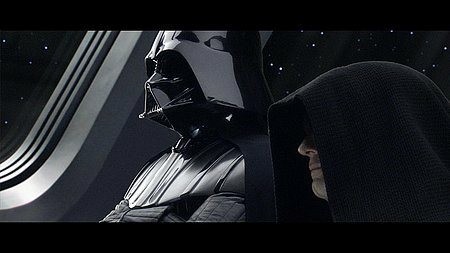 Meanwhile the secrets of the Dark Side of the Force are too much for Anakin to deny as the Evil Lord Sidious tempts him to turn against his master and his allies. Download Star Wars: Episode III - Revenge of the Sith in Digital HD from the iTunes store. Star Wars: Episode III - Revenge of the Sith images are © 20th Century Fox. All Rights Reserved. Duality. Good vs. Evil. Light vs. Dark. What series of films better exemplifies these themes than George Lucas’ iconic Star Wars? From the moment the infamous “opening crawl” graced the big screen in 1977, Star Wars has captivated audiences with its mixture of action, adventure, spirituality (The Force) and romance. The overarching story focuses on Anakin Skywalker a Jedi Knight (the guardians of peace and justice in the galaxy) who succumbs to the dark side of the force to become the evil Lord Darth Vader. Any child of the 80’s can act out the rest of the original trilogy complete with their own light saber sound effects. Out of a need to explain the back story of one of the most recognizable movie villains of all time Lucas began releasing the “prequels” to the original trilogy in 1997. The first two films (“The Phantom Menace” and “Attack of the Clones”) were met by a critical panning and rocking of the core fan base. With the 6th and final film (3rd of the new prequel generation) Lucas transcends his critics of recent years and delivers a forceful punch to complete his outer space saga. In answering the questions which fans have been asking for 30 years he proves that there is still good in Star Wars. 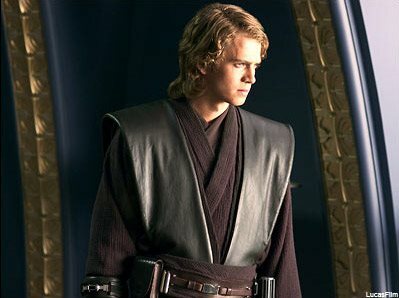 Anakin Skywalker (played by a more mature Hayden Christensen) is now a Jedi. However a secret marriage to his now pregnant wife Padme (miscast, but ravishing Natalie Portman), and a lack of respect (or is it fear of his power) amongst his peers leads him to question his place in the galaxy. 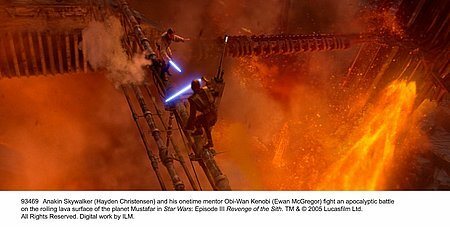 His relationship with his mentor Obi Wan Kenobi (a heroic Ewan McGregor) begins to break down when he is denied the rank of “Master” for killing one of the evil Sith Lords Count Dooku (blink and you missed him Christopher Lee). Dreams of the death of wife lead him to seek council from his friend and father figure Chancellor Palpatine (a determined and powerful Ian McDiarmid). After revealing his true identity (is this a secret to anyone?) Palpatine seduces Anakin to use his powers for evil. And boy does he! 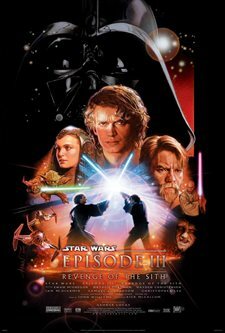 The second half of the film surrounds the downfall of Anakin Skywalker into a murderous tyrant aimed and wiping out the Jedi. With the help of “Order 66” (a call to the genetically engineered to follow any orders Clone Troopers) Anakin kills anyone in his path including children. This sequence alone probably warranted the PG-13 rating (every other film in the Star Wars saga has been PG). 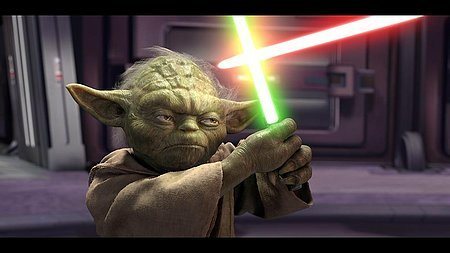 The final battle between Obi-Wan and Anakin Skywalker is inter-cut with a battle between the evil Sith Lord Darth Sidious and his sarcastically referred to “little green friend” Yoda (voice of Frank Oz). By far the most intense light saber battle you have ever or will ever witness, the Obi Wan Anakin duel is what the fans have been waiting for and it delivers. As always Industrial Light and Magic blows us away with outstanding CGI characters, lush living digital landscapes, and sound design worthy of your 6.1 surround system. The effects are complemented by the explosive score of the ever brilliant John Williams. If you thought “Duel of The Fates” was cool wait till you hear “A Hero Falls” Williams virtually defined the power and emotion of what is happening on screen and truly is the heart of the film. As stated before the final battles are worth the price of admission alone and some credit must go to long time stunt coordinator Nick Gillard (who makes a cameo appearance). Ewan McGreggor as Obi-Wan Kenobi has been solid throughout the prequels and deserves his top billing in this film. His final plea to bring Anakin back to light side is a highlight of the saga and you can truly see the pain on McGreggors face when Anakin Skywalker truly dies and Darth Vader is born. 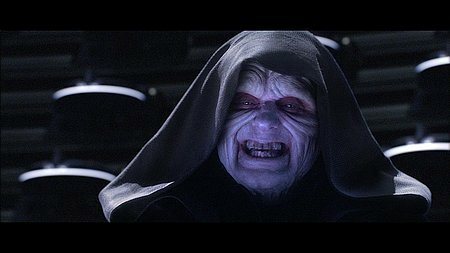 Finally unleashed, Lord Sidious shows how truly evil he is. From his slithery light saber duel with Mace (Shaft) Windu in which he ultimately fakes Anakain into killing his friend, to the final showdown with an overmatched and overconfident Yoda. He truly exemplifies the Dark Side of the force. Natalie Portman was just never the right choice to play the mother of Luke and Leia. While she is fantastic in many other films (Garden State) this genre just seems not suited for her. Her chemistry with Christiensen is non existent which was essential for the less than spectacular lines she was given by Lucas to create a romance between the two. And you left with no real feeling of sadness when she ultimately dies giving birth to Luke and Leia. General Grievous as a villain who for those who are unfamiliar with “The Clone Wars” cartoon series has an unexplainable hacking cough. Ok, Ok, he’s supposed to be some sort of predecessor to Darth Vader (we all know his asthmatic breathing problems) but the cough is neither cool nor necessary and detracts from the character. He has some cool moments (like his light saber duel with Obi-Wan) but Obi Wan made short work of this utterly disposable character. In the end we are back, figuratively, to the beginning. A circle complete, a changed perception of the man beneath the mask, and one hell-uv-a 6 movie marathon. The saga truly is the story of the good and evil in all of us. Light vs. Dark. Good vs. Evil. Duality. Star Wars: Episode III - Revenge of the Sith images © 20th Century Fox. All Rights Reserved.